Opis: How would you like to spend your holiday in low earth orbit? 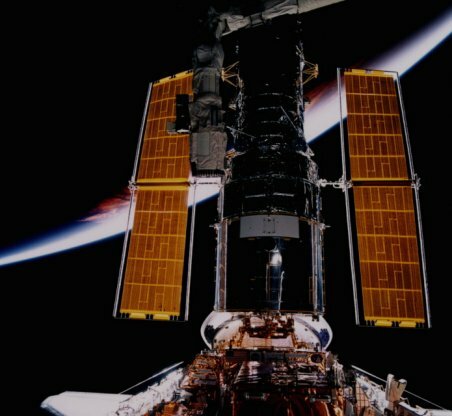 That's what the crew of the space shuttle Discovery is doing as they deliver six new gyros and a faster main computer to the orbiting Hubble Space Telescope. The telescope has been holding in safe mode since November 13 and will use the timely "gifts" to resume its exploration of the distant Universe. This mission, STS-103, is the third mission to service the famous space observatory which was placed in orbit by Discovery on April 25, 1990. Seen here in a 1997 picture from STS-82, the second servicing mission, the space telescope, flanked by its gold-colored solar panels, hangs above the shuttle payload bay. The Earth's bright limb is in the background. Discovery closed with the Hubble on Tuesday and crew members are conducting space walks to install the new equipment. Discovery is scheduled to return to Earth after Christmas, with a December 27 landing at Kennedy Space Center - but you can e-mail season's greetings to the orbiting crew.